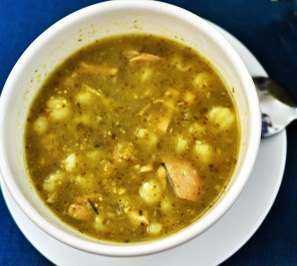 Chicken or Pork Crock Pot Posole! 6 to 8 green chiles chopped. Salt to taste. I normally won't add salt due to the chicken broth being salty enough. Combine all ingredients EXCEPT for canned hominy and GREEN CHILES in a crock pot. After 6 or 7 hours take chops or chicken out of the pot and take the bones out. Break up and place back in pot. Add hominy (drained and washed) and green chile. Cook another 30 minutes to an hour or when you're ready to eat. Make a full pot because if you have any company, it will be gone! If not, it just gets better and left overs are just as good if not better than the night you made it. Serve with soft flour tortilla's or I prefer breaking up corn tortilla chips in mine. Mmmmm this is sooooo good!